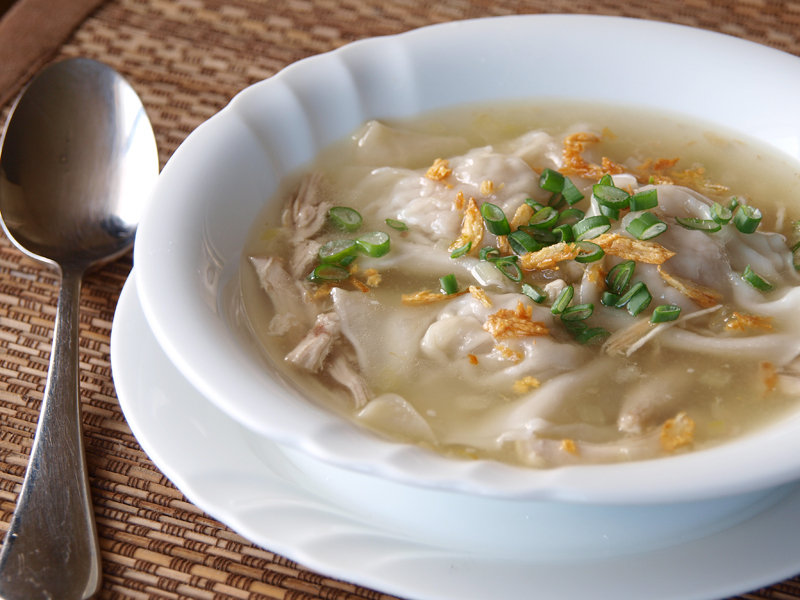 Pancit Molo is a Philippine dish which is more of a soup rather than a pancit (which is noodle in Tagalog) it shares the similarity with the Wonton Noodle Soup sans noodles. This dish originated from the province of Iloilo which is also known for La Paz batchoy, Bacalao, Dinuguan, Puto and Piyaya, this is one of my favourite Filipino cuisines. As I was mentioning this dish may have originated from Wonton noodles or what they call Wantan Mee, a Cantonese noodle dish popular in Hong Kong, Malaysia, and Singapore. The concept is the same apart from the noodles, which was replaced by using the Wonton Wrappers as its noodle. The usage of wonton noodles is a sign of Filipino’s ingenuity in their cuisine where extending is a common thing as well as the rule “nothing gets discarded”, it may be that when this was invented they were making Wonton soup but there are left over wrappers and the inventor might have thought why not put the leftover wrappers on the dish. The dish is usually served in a hot broth, garnished with leafy vegetables, wonton dumplings and chicken pieces. In a bowl combine all the ingredients except for the molo wrapper. In a pot heat oil then sauté garlic and onions. Add chicken then stir fry for a bit. Pour in the broth, and then bring to a boil. Once boiling add the prepared wontons. Simmer for 3 minutes then add the leftover wonton wrappers then simmer for additional 2 minutes. Top with spring onions, fried garlic and drizzle with sesame oil. Nice and sure wanton and growing in Malaysia, how not to drool but at times we go for the one with shrimps/prawns only inside. Sounds like comfort soup, I really like the way it is garnished too. Hope the New Year is off to a great start for you! It sounds soothing and delicious, and yes, wonton wrappers make wonderfully delicate “noodles” in soups. Yummy! That looks so satisfying, but not too heavy. I love it. Happy New Year!!! Nice and rich this soup, very exotic, I love it! its so interesting when recipes come from some random ingredient being added or omitted or substituted! Thank you so much so sharing this recipe. I love pancit molo. And if I finally can make it, yay! Had been a fan of your blog. I do get most of my recipes from you. Great work! Very interesting learning about origin of dishes and different ingredients, enjoyed the post! What a delicious meal – it looks great. Raymund! Sorry it took some time to get here… Thank you so much for including my How To as reference. I’m so flattered! This warm wonton soup sounds so perfect for my new year diet…. (eat healthy!). Looks yummy~! i don’t know what’s with the wonton but i always love it when its one of the ingredients..
Yum that broth looks so clean and tasty. Looking yumm!! What a coincidence in language as well! Pangsit is actually what Indonesian call for wonton. I love bakso (Indonesian meatball soup) and it consist beef ball, stuffed tofu, noodle, wonton, fried wonton. As an Ilongga, i really miss this dish!